With the announcement and trailer earlier this week of Rayman Adventures, it seemed like an opportune time to replay Rayman Legends. Instead of just replaying the Wii U version, I decided to dust off my PlayStation Vita and try that version out. A gamer can never have too much Rayman, right? Is touching still considered good? Wait. Wrong handheld! Those who have followed the development and release of Rayman Legends probably know the story and controversy of its launch well. The game was originally a Wii U exclusive, but due to the poor sales of ZombiU, Ubisoft got cold feet, delaying the release of the Wii U version while porting it to several other platforms. 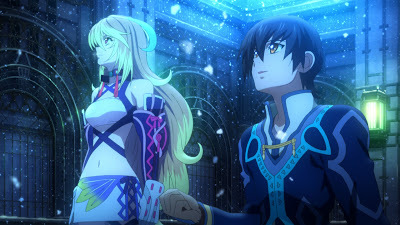 The title ended up bombing everywhere sadly, most likely due to its September launch period, right in the thick of a busy release schedule of games that easily overshadowed it. 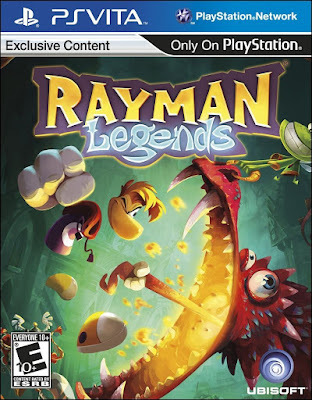 It's a good thing, though, that Rayman Legends was delayed, because in the end, during the delay period, the developers added more content to the title. 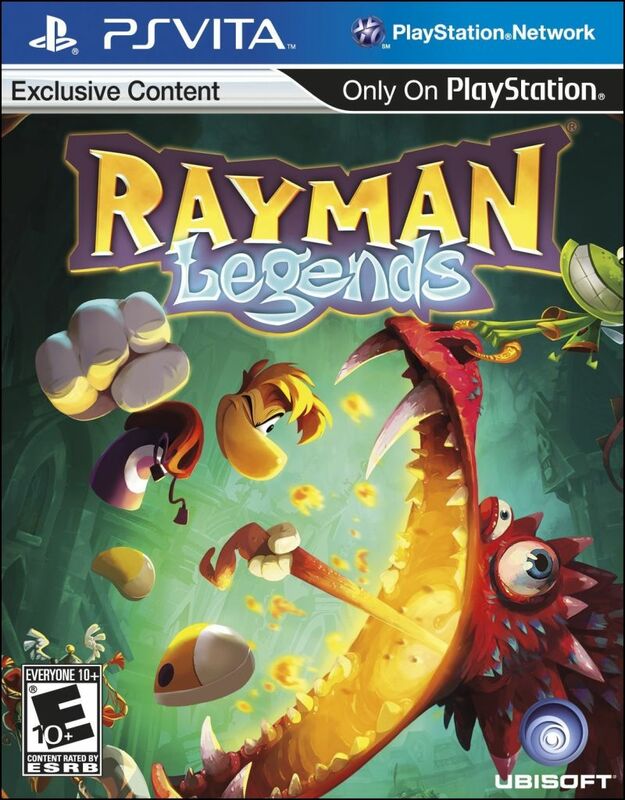 If Rayman Legends released without its "Back to Origins" content (i.e. the added content), the game would very much not be worth its full cost price point. Wow! That breeze feels nice between my legs! 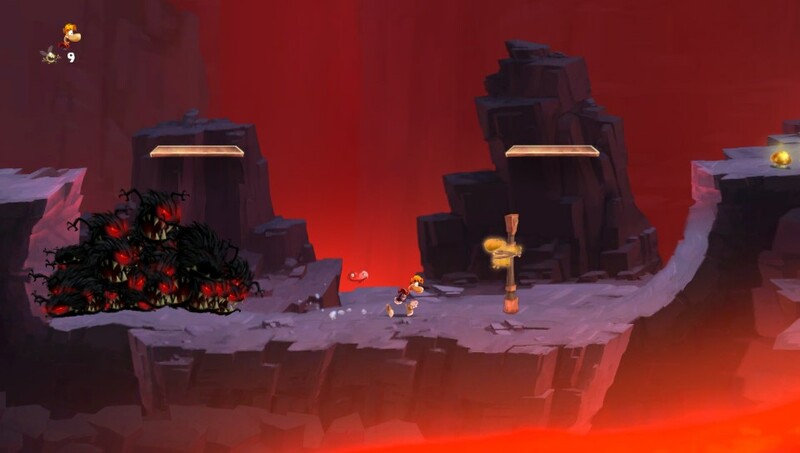 Rayman Legends is much more like its predecessor Rayman Origins than earlier Rayman games. It's much more forgiving with its checkpoints aplenty, and its level design is more akin to Origins than say, the original Rayman. 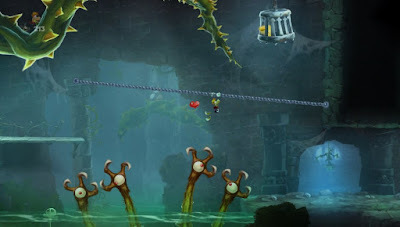 Each level in Rayman Legends has its own gimmick to it, and I say that word with a positive connotation. 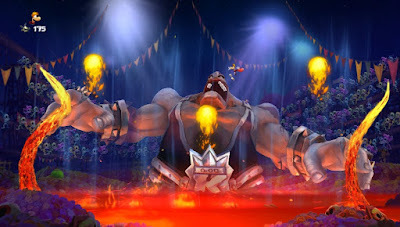 One level has Rayman rushing through a contraption-filled castle, while another presents a set of towers that sink into sand, threatening to bury Rayman with it if he doesn't keep the pace. Don't worry about drowning, Rayman. All you have to worry about is this security! 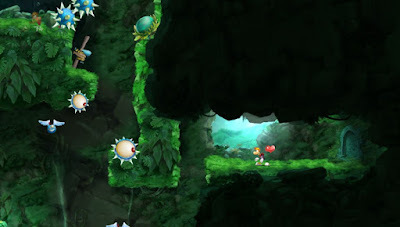 Like the Wii U version, there are special Murfy levels, of which there are about two per the game's five worlds, which have you utilizing the touch screen (whether the front screen or the rear-- it's your choice) to manipulate platforms, move objects, freeze enemies in their tracks by poking or tickling them, and otherwise assist your platforming AI partner. Like the Wii U version, you can get a local buddy to play with you, but the process requires two PlayStation Vita systems and two copies of the game. Not exactly the easiest setup, especially since those who have the access to such a setup are rare. One of several creative boss encounters in Rayman Legends. Otherwise you're stuck with an AI partner, who for the most part behaves well and does what you'd want it to do. However, during the moments where the AI doesn't handle itself well will have you flipping out. It's highly frustrating when the AI partner saunters to its death when you perfect laid out a path for it to follow. It's also a bit trying having your finger covering up the small real estate that is the Vita's screen. Too many times I couldn't see what was happening because I was using my finger to move an obstacle out of the way. Thankfully, much like the traditional solo platforming levels, there are an abundance of checkpoints, so death is rarely punished severely. This makes the sometimes daft partner AI and bothersome touch screen issues all the more tolerable. 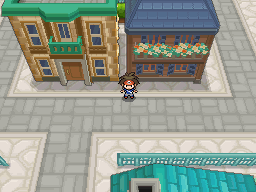 Many Teensie bonus room locations are hidden well. 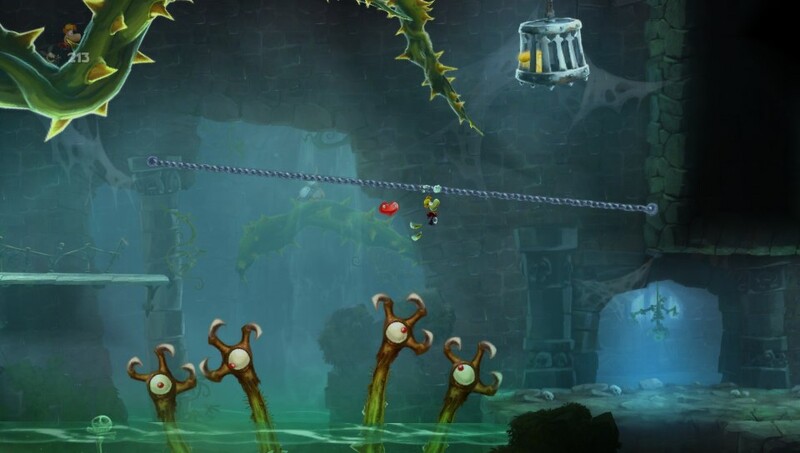 Most levels in Rayman Legends have ten Teensies to uncover. Eight of which are spread out in secret locations in the level themselves, awaiting Rayman to break them free from their cages and otherwise captivity while the other two are in special bonus rooms where completing a certain task frees the Teensie from their prison. 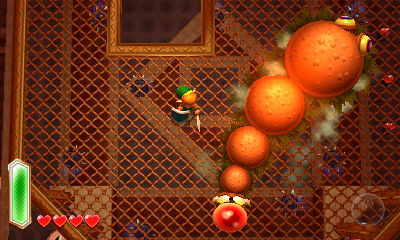 Teensies are vital to collect for the most part, as some levels have locks on them that will only open once enough of the blue dwarf-like characters are collected. "Psst. Be a pal and break me out of here, huh?" 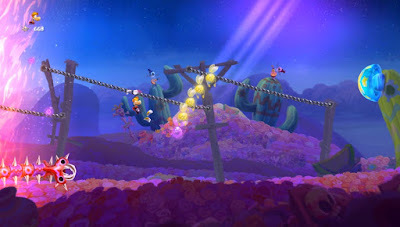 In addition to rescuing Teensies, Rayman can also collect Lums. Collecting a specific amount in total for a given level can unlock up to three trophies-- bronze, silver, and gold-- as well as award you with lucky tickets. The latter have you scratch them off with the touch screen to unlock an assortment of prizes, including the aforementioned "Back to Origins" levels. 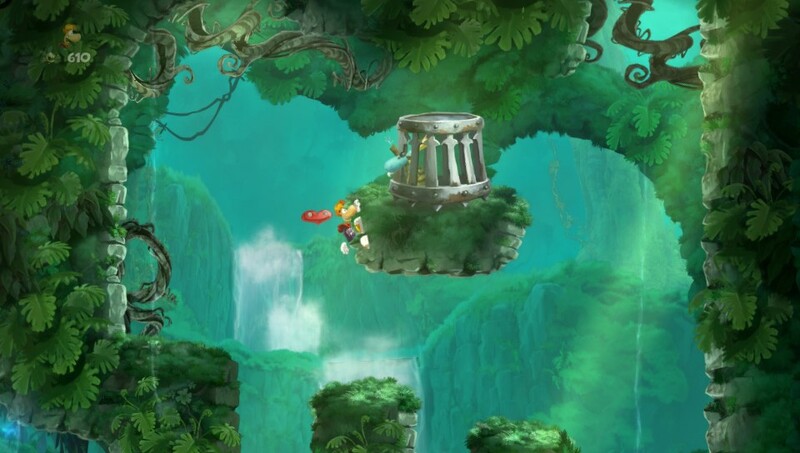 Yes, most of the levels from Rayman Origins, the previous Rayman game which also saw a release on the Vita, have returned with a new coat of paint, new locations for Teensies, and familiar designs to anyone who has played Origins. These levels essentially double the longevity of what would otherwise be a relatively short game. While it would have been nicer to see more wholly new levels, these of the "Back to Origins" variety are better than nothing. Alongside these levels are unlockable music-based levels that are highly entertaining. They present you with a cover of a song, and you jump, punch, kick, and otherwise platform in time with the music. From "Black Betty" to "Eye of the Tiger", these levels are well designed and fun to play, even if you're just playing them repeatedly just for the enjoyment of it. Rayman has the eye of the tiger in this music level. However, what isn't a fun and enjoyable series of levels is the last batch of unlockable levels. These are 8-bit representations of the music levels. While on their own, they are just fine, but what kills the entertainment factor of these levels and brings up the frustration several fold are the intentional graphical glitches that occur while playing these. They're meant to imitate what it was like playing on an old television set, but things like immense blurriness, static, and other graphical tricks just make these levels a pain to play and pretty unfair, too. These levels make up the weakest part of Rayman Legends's offerings. Outside of the single player story mode, there are daily and weekly online challenges that task you with reaching the goal in the fastest time possible, collecting the most Lums, and making the farthest in a given level. While these online challenges are fun for the first few weeks, as it is great to compete with other players indirectly via the leaderboards, there are but a handful of different level types to play before you start seeing repetition arriving. It doesn't help that Rayman Legends also houses some insane grinds if you want to get the game's platinum trophy. Careful, Rayman. Don't let those guys give you a hand! Rayman Legends looks absolutely divine on the PlayStation Vita screen. Colors are rich, environments are lush, and characters are lively and full of detail. 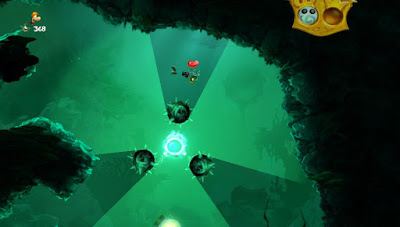 The UbiArt engine is used to phenomenal effect in Rayman Legends, rarely displaying any signs of slowdown. When it concerns sound, the soundtrack is full of catchy orchestral ditties and plenty of eccentric, eclectic sounds that I couldn't help but smile while listening to them. A heart next to Rayman means he can take an extra hit before dying. If you can deal with some of the minor issues of the game (such as some annoying partner AI during Murfy levels, a shortage of different levels in the online challenges mode, and a repeat of content from Rayman Origins) and don't mind playing a console experience on the small screen, then the PlayStation Vita version of Rayman Legends is a desirable entry for your gaming library. Rayman controls as tightly as a 2D platforming fan would want and expect, and the game is wonderfully designed from top to bottom. For avid gamer types like myself, our work has been cut out for us lately. Between console and PC sessions we’re presented with a wholly different entity of gaming in our mobile phones, and in that department we certainly aren't lacking in choice! The Android and Apple app stores are absolutely teeming with games of any and every variety, suited to any and every taste – resulting invariably in our being spoiled for choice. With this in mind, here’s a pick of some of the best, the cream of the crop so you don’t waste any valuable time combing the stores instead of playing straight away. With the imminent release of hotly-anticipated RPG sequel Fallout 4 comes smartphone teaser Fallout Shelter, wherein you manage and expand one of the Vaults shielding the remnants of humanity from the post-nuclear wasteland outside its walls. You can build rooms, manage population, and scavenge the outside world for much needed currency and resources. Sadly, this is only currently available to iPhone users, but Android users can rejoice in that their precious time won’t be completely taken up by this addictive game! 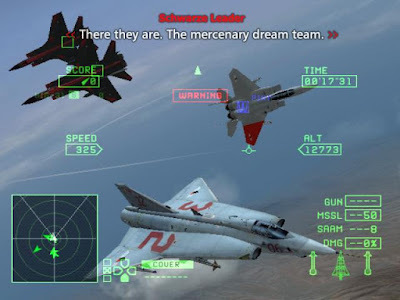 An absolute classic of the mobile gaming world, Air Control sees you directing ever-expanding waves of aircraft onto a landing strip before a mid-air collision or crash land occurs. Infuriating, addictive and free to play, it is the perfect time-killer for when you can’t guarantee the time for something more engrossing. Dream Run is an interesting new game from online gaming merchants Uptown Aces, which sees you delve into the underground environment of street racing, action and chance. Immerse yourself in the experience with high-end graphics, unique user interface and opportunities to utilize the exciting ‘Instant Trigger Chance’. Expect gritted teeth and feelings of intense exhilaration. Frozen Bubble capitalizes on the undeniably successful genre of game which took early consoles by storm in the 90s, and has endured until now, as you take charge of a gem cannon and race to destroy gems by grouping those of the same color before you are subsumed by a flood of them! 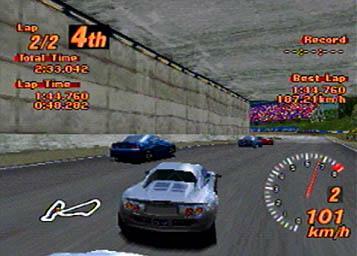 This game will give you nostalgia goosebumps and a hurt thumb to boot. The latest themed outing from TT Games, LEGO Batman: Beyond Gotham is a lovable pint-sized version of the incredibly popular LEGO series, wherein you control a blocky Caped Crusader as he teams up with the Justice League to take on the mighty Brainiac… in space! Unlock more than 100 playable characters as you progress through the game, as well as special suits which grant you particular abilities. Unashamed fun for any age, and certainly one to keep your attention on a long journey home. And there it is! An (incredibly) concise list of the games worth downloading from the veritable smorgasbord of content that is the mobile app store. What are your favorites? Imagine if you will that you just completed a difficult and excruciating level or just beat what you thought was an impossible boss. Now, the feat alone is impressive, but what makes it even more special is a theme to accompany your victory. That is actually what this top ten list is all about. These are the jingles and themes that play when the battle is won, the level is completed, and the mission is a success. Just click on the yellow links to hear the themes I will be talking about on this victorious list! 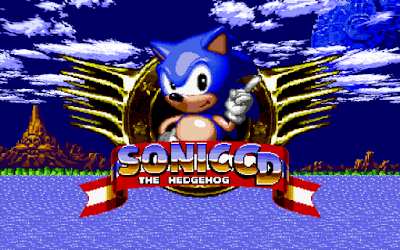 After Metal Sonic is destroyed, another one of Dr. Robotnik's machines has been vanquished, or something as simple as making it to the end of Act One, this U.S. version of the stage clear theme rocks with its great guitars, horns, and awesome sound. Success! Not just towards the defeat of a behemoth-sized monster, but it's also what this triumphant victory theme with deep brass and majestic strings is called. Take the opportunity after battle to carve up the lifeless body of your defeated prey while you have the chance. 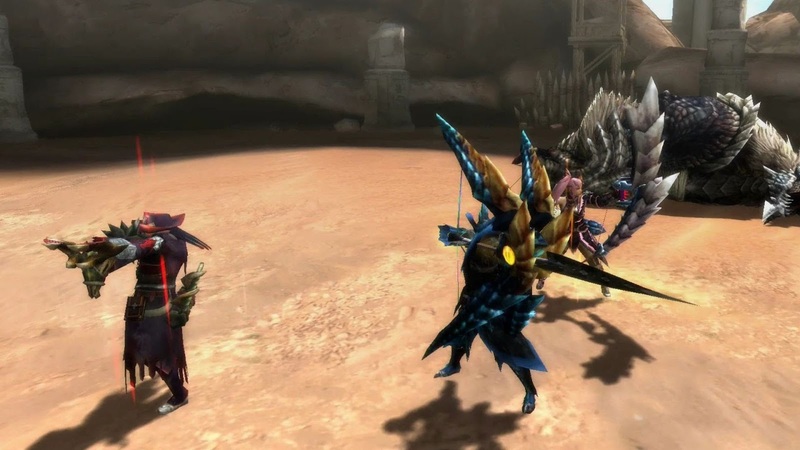 Sure, that's a bit macabre, but alas, that is the life of a monster hunter. It doesn't matter if it's Ice Penguin, Storm Eagle, Spark Mandrill, or any of the other five Mavericks that Mega Man X has to take down. This is the victory jingle that plays after X has outsmarted and outmaneuvered the Maverick in battle. You earned that Maverick's special weapon, X, much like the player earned the ability to hear this sensational synth jingle. No Mario Kart game has a greater celebration for the ears for coming across the finish line in first place than Mario Kart 64. With just a handful of ascending notes and pitches comes a victory theme that makes the player clench his or her fists in triumphant, knowing that they outraced the other seven opponents on the track. Based off the boss clear theme from The Legend of Zelda: A Link to the Past, A Link Between Worlds's boss clear fanfare booms with impressive brass. 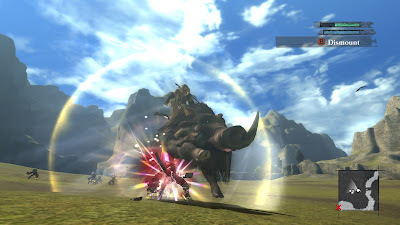 It's an overall more victorious sound that engulfs the player's ears after a successful battle against one of the many dungeons in the game's formidable foes. 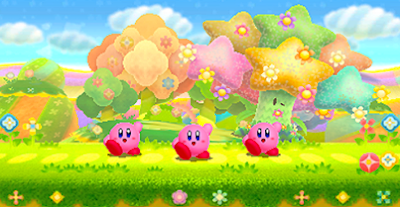 After battle against a big boss, Kirby can't help himself but shake his groove thing and enter a celebratory dance. It doesn't matter if the battle was against Whispy Woods, Kracko, or whomever was foolish enough to tango with everyone's favorite pink puffball, this is the brief melody that is heard while Kirby shakes what his mama (or whoever) gave him. Passing through the goal of a level, this is the theme that plays, accompanied by synth banjo. 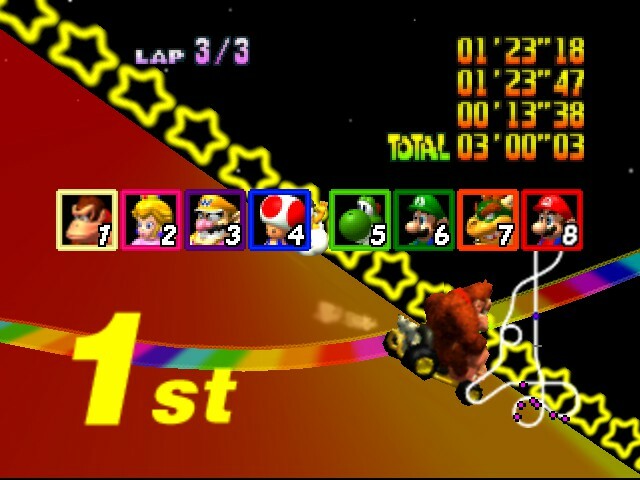 When this theme plays, Mario, Luigi, and sometimes Yoshi can temporarily rest, knowing that the challenging obstacles are for now behind them. Well, that is until the next level where a whole new batch of problematic hazards await them. 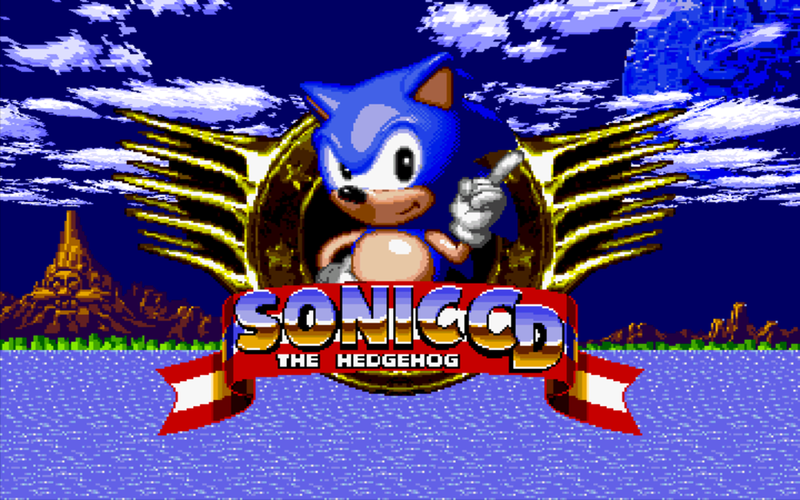 A victory theme so nice that it has since been used for a majority of future Sonic the Hedgehog games, including a good portion of the modern 3D games. 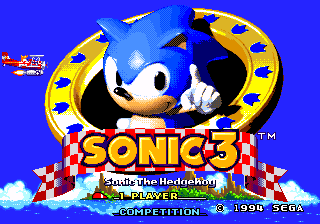 This jingle brings back memories of beating an act's boss and patiently waiting as Sonic's ring total gets converted into points and perhaps extra lives, too. 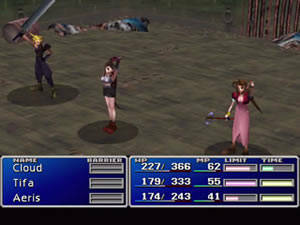 Those opening notes are so darned prolific in gaming that there probably isn't any reason to have to explain why Final Fantasy's victory jingle is number two on my list. However, I will do so anyway. For most mainline Final Fantasy games, this jingle played after every successful battle has been an important musical part of the series, and one cannot help but love its sound each and every time it is played, no matter the version. This is a totally cliche choice, so I apologize ahead of time. However, it's also one of the most classic victory jingles / level clear themes in gaming history. 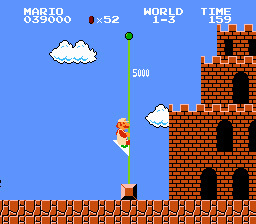 Through either riding down the castle's flagpole or being told that Mario's princess is in another castle, this theme congratulates you on a successful run through one of Super Mario Bros.'s challenging levels. What video game victory jingles do you like the best? Let the SuperPhillip Central community know in the comments section below! Rayman returns, and this time it's in a mobile exclusive game that is highly reminiscent of both Rayman Legends and past mobile games, Rayman Jungle Run and Fiesta Run. 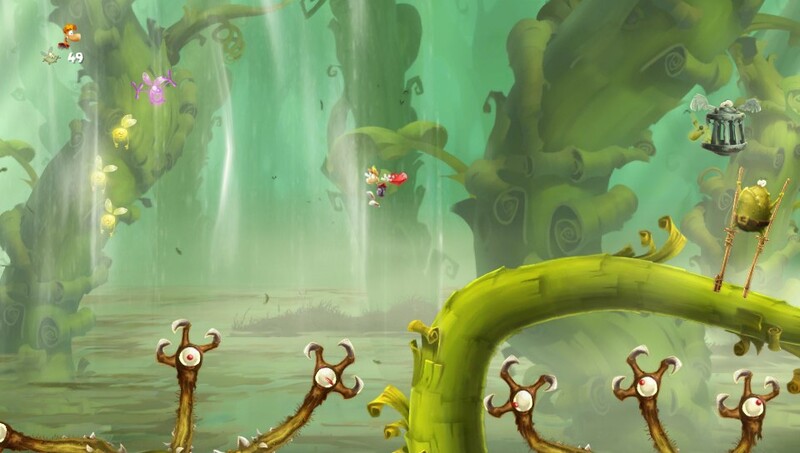 Rayman Adventures is due out this fall, and it looks like it keeps what makes the platforming series so enjoyable.